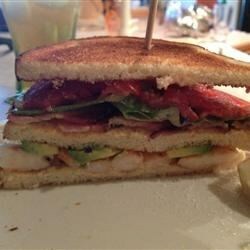 "With tasty grilled shrimp and spicy mayonnaise, you won't want to have a BLT any other way! " Combine mayonnaise, chipotle pepper, lime juice, and a pinch of salt and pepper in a bowl. Puree until smooth with a stick blender. Alternately, you can use a food processor to puree the ingredients. Cover and refrigerate until ready to assemble sandwiches. Preheat an outdoor grill for medium-high heat, and lightly oil the grate. Toss the shrimp in a bowl with olive oil and salt and pepper to taste. Cook shrimp on the preheated grill until they are bright pink on the outside and the meat is no longer transparent in the center, about 3 minutes on each side. To assemble sandwiches: Spread prepared mayonnaise dressing generously on 1 slice of bread. Arrange half of the shrimp and avocado slices on top. Place another slice of bread over the avocado, and spread another layer of the dressing. Top with a lettuce leaf and 2 slices of tomato followed by a third slice of bread. Repeat with the remaining ingredients for the second sandwich. What's cooking on Long Island? Anne's triple-decker grilled shrimp BLTs. Loved these sandwiches. Made them myself with two chipotles and Wasabi-Mayo to start with. SPICY! Danged good. is there a piece of cheesecake to go with this??? Love this sandwich at the cheesecake factory.